The Estilo is one of the most recognizable and popular line of BJJ gi’s in the opinion of myself and many others. With their new Estilo 6.0 they claim further ground in the Gi market. 550 GSM Pearl Weave Jacket and 12oz Canvas Pants. Embroidered Tatami and Estilo Logos. Tatamis F, L, S and XL sizes. Apart from technical features, this Gi has a premium look and feel. When you first look at the Gi you are struck by detail levels in just the right amount. It is not too much, nor too little. The white and black one has very nice colouring and the prints on the inside of the jacket further induces the feeling of a premium product. The linings inside the cuffs and base add a nice touch. I myself play a lot of guard and like to pass standing and fast. So naturally I am very particular about freedom of movement in the Gi, dry and sweaty. One of the worst feelings for me is the jacket sticking around my shoulders when playing guard, or the pant not allowing me to squat down deep or kick my legs out. The Estilo 6.0 does a decent job at this. In my honest opinion, the jacket “moves” better than the pants. The pants feel sticky to me, especially when squatting down deep. More so than other Gi’s I have owned or own today. The jacket comes with a heavy feel, but it does provide satisfactory ventilation. But I would not wear it during sparring on a hot summer day if I did not have to. The pants provide ventilation and stretch material in your inner thigh area, similar to the Estilo 5.0 I’ve had the Estilo 6.0 for about 6 months and it is holding up to one hundred percent. No lose logos, no threads hanging out and nothing ripping or coming off. This thing can take a beating. The Gi featured in this review is a size A2. I am about 5ft 11” and 160 lbs. It fits me very well, note that I have slightly longer arms than average, and longer legs. The sleeves are just a tad short but approved for competition. The pants fit me decently, and in all fairness my longer limbs may be what’s causing me discomfort when moving my lower body in these pants. Despite causing me slight limitations when squatting down deep or kicking out my legs of someone’s guard, this Gi is still what I would consider my go to Gi. Together with the Estilo 5.0, these two Gi’s are my “daily drivers”. They feel durable, they are very comfortable to wear and do not give you an itchy feeling. So apart from looking nice, they feel nice. I would happily recommend this Gi to others. I hope my review has provided you with some insight, so that you can make an educated and value driven purchase! Tatami Estilo 6.0 review was written by Ville Melgén, after several months of training. It was not sponsored or otherwise endorsed by advertisers. The Estilo is the longest running BJJ gi in Tatami’s history. With over six years of consistent improving and developing, Tatami now brings forth their latest edition: the Estilo 6.0. The Estilo 6.0 lays claim to being a cut above all of the rest in terms of providing fighters with one of the best looking and best priced gis available on the market. The Estilo 6.0 is awesomely durable and is noted to come in a ton of color option combinations like: black/black, white/blue, white/black, black/silver, blue/silver, blue/navy, navy/gold, and white/pink. 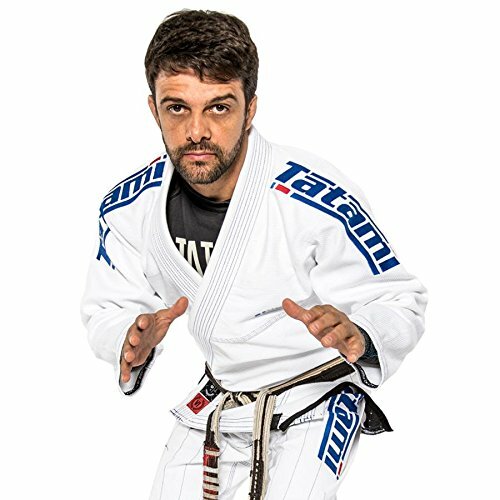 One of the coolest things about the ultimate development of this gi is the fact that the team at Tatami worked closely with actual fighters (such as Robson Moura, Vitor “Shaolin” Ribeiro and the 2017 ADCC Champion JT Torres) in order to ensure that the gi provides fighters with all the comfort, durability and reliability that they are seeking in a gi. People are raving about the fact that the gi features super high quality embroidery that adorns the shoulders and the outside leg region of the pants. On the back of the neck and the right bottom shin part of the pants, fighters will also note that the Estilo logo is subtly placed as well, along with small embroidery with the text “Estilo VI” on the front of the jacket. And, the neck yoke and side vent lining are also sublimated which adds to the overall high quality detail of the gi. There is even an awesome woven taping that lines the inside of the cuffs (both ankle and sleeves) and the bottom of the jacket. The jacket also features the consistently popular Y-shaped jacket vent which provides for a significantly better fit at the base of the jacket. The Tatami Estilo 6.0 is receiving some pretty awesome reviews for a number of good reasons. It appears as if Tatami took all of the best features from previous gi styles in the series and improved upon them in a number of ways in order to create one perfectly flawless gi. Hi, I am Ville. Apart from my business studying, I spend most of my time on the mats. 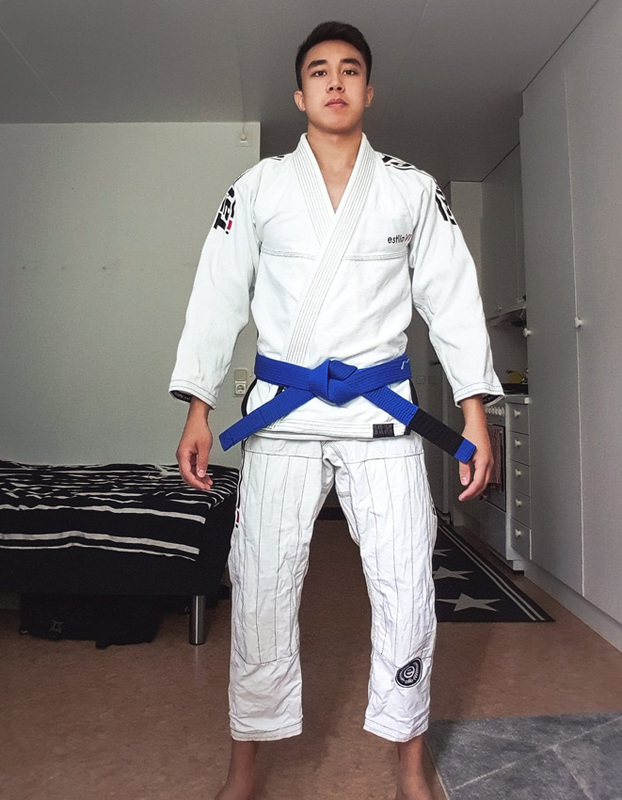 I am coming up on my third year of BJJ and do not plan on stopping! I have owned a bunch of different Gi’s, some have been returned and some have been crowned the “special competition only gi”. Comment from discussion Tatami Estilo 6.0 – Review.